For the structure in Potsdam, Germany, see Neptune Grotto. The stairway leading to the cave. Neptune's Grotto (Italian: Grotta di Nettuno; Catalan: Cova de Neptú) is a stalactite cave near the town of Alghero on the island of Sardinia, Italy. The cave was discovered by local fishermen in the 18th century and has since developed into a popular tourist attraction. The grotto gets its name from the Roman god of the sea, Neptune. 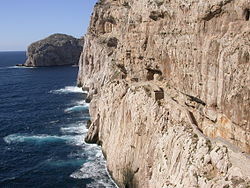 The entrance to the grotto lies only around a metre above the sea level at the foot of the 110-metre-high Capo Caccia cliffs and the cave can therefore only be visited when the waters below are calm. A stairway cut into the cliff in 1954, the 654-step escala del cabirol (goat's steps), leads from a car park at the top of the cliff down to the entrance. The grotto is also accessible via a short boat trip from the port of Alghero; these trips are arranged hourly during the summer, but less frequently during spring and autumn. Two other grottoes lie nearby, the "Green grotto", which is not open to tourists, and the Grotta di Ricami, which is only accessible from the sea. Under water all around there are many big under water marine caves, paradise for the scuba-diving fans, the bigger and the most famous is the Nereo Cave, visited each year by thousands of scuba divers. The combined length of the cave system is estimated to be around 4 kilometers, but only a few hundred metres are accessible to the public. Inside are passages of lit stalactite and stalagmite formations, and a 120-metre-long saltwater lake, which is at sea level. The cave was once a habitat for the Mediterranean monk seal, which has become extinct in the area. Tourists visiting Neptune's Grotto are given guided tours and led single-file through a lit pathway, with tour guides providing information about the cave in Italian and English. The grotto is widely visited, and during the peak tourist season in August, can contain around 200 people at a time. Neptune's Grotto was the set of the movie Island of the Fishmen, filmed in the summer of 1978. For approximately two months the Grotto was transformed into a gigantic set. The science fiction movie starred Barbara Bach, and was under the direction of Sergio Martino. ^ a b c "Guide to Grotta di Nettuno". algherosardinia.net. Retrieved 2008-04-09. 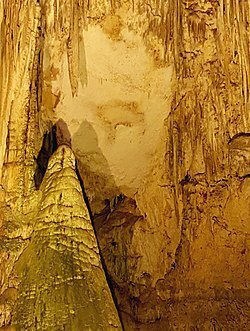 ^ a b c "Alghero und ihre Tropfsteinhöhlen - die "Grotte di Nettuno"". casa-cravallet.de (in German and Italian). Archived from the original on 2007-12-14. Retrieved 2008-04-09. ^ Maggie O'Sullivan (2003-08-12). "Sardinia: In splendid subterranea". The Daily Telegraph. Archived from the original on 2008-04-21. Retrieved 2008-04-09. ^ "Grotta di Nettuno". hellosardinia.com. Archived from the original on 2008-01-31. Retrieved 2008-04-09. This page was last edited on 8 March 2019, at 05:30 (UTC).